Is the unemployment rate too low? America's job market is bit like the porridge in Goldilocks. You don't want it to get too hot or too cold. It needs to be just right. Some experts believe it's starting to get too hot. 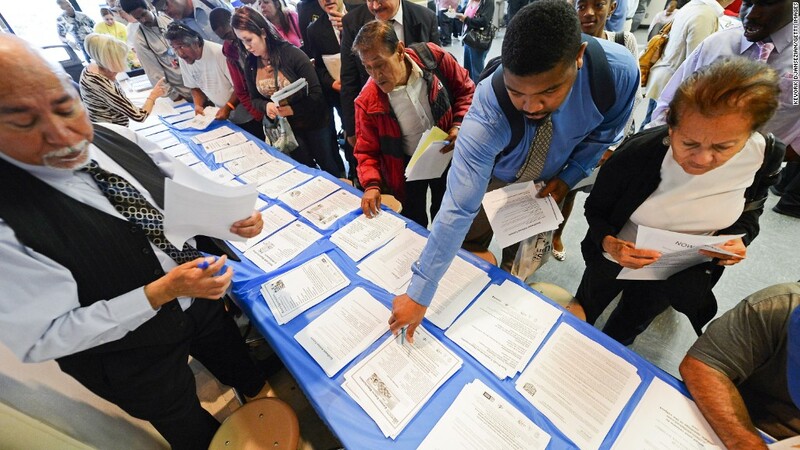 The U.S. unemployment rate fell to 4.3% in May, according to Labor Department numbers published Friday. It's the lowest level since 2001. That's why some experts think the U.S. economy is at, or getting close to, something called "full employment," which means employers can't find many more available and qualified workers for open jobs. Chris Rupkey, chief financial economist at MUFG Union Bank in New York, notes that when the economy reaches full employment, that means there aren't enough people out of work to find new jobs. And if employers can't find more workers that they might need, they have to raise wages to retain their existing workers. This sounds great though, right? Why is it a problem of people are getting bigger paychecks? True, but the problem is that it will be harder for the economy to grow a faster pace if the number of new jobs added starts to slow. And it has. In May, job gains were lower than expected and job figures for March and April were revised down too. "I would say that full employment could present a headwind to the future pace of economic growth," says Sam Bullard, senior economist at Wells Fargo. "Firms continue to point out they're having difficulty finding qualified labor." In 2001, the last time the unemployment rate was this low, the U.S. went into a brief recession. Related: Trump takes credit for 1 million jobs. Not true. However, some experts point out the that the economy was much different back then. Before the 2001 recession, the economy was red hot, averaging over 4% annual growth. The Federal Reserve's interest rate was also much higher -- 4.5% -- than today's rate of about 1%. That made it more expensive for businesses to borrow money and Americans to get a mortgage 16 years ago. Wage growth was also much higher in 2001, about a 4% annual pace compared to 2.5% today. That's why some economists are not worried about how low the unemployment rate has gotten. U.S. workers have yet to see a big pick up in wages. So it's premature to worry about a rise in inflation grinding the economy to a halt. "I don't think there are risks to economic growth," says Bernard Baumohl, chief economist at the Economic Outlook Group, a research firm. "The big question is, why haven't we seen wages pick up significantly?"